This page is intended for CHURCH messages, requests and ad-hoc information. Please Scroll down to see all the notices. IF YOU HAVE ANY NOTICES YOU WOULD LIKE TO BE DISPLAYED HERE, PLEASE CONTACT ALAN PRICE. Kingsgate food contributions - Greenhill Community church provide a hot meal on Fridays to those who need it and also supply food boxes to families in need. Contributions of food would be very much appreciated and can be left in the box in the church porch. Trussell Trust Food Bank vouchers are available from Andy should you know of anyone in need. Click the icons above for information on events taking place in the Diocese and to access the ‘Shaped by God’ Mission initiative. Also see our Blog which will include Sermons, Talks and other articles. ‘This Week’s Diary’ for late changes. Would you be able to help occasionally on Sunday evenings? It would be good to have a few more people on the rota to serve refreshments after the evening service. Please contact Alan Sankey if you would be willing to help in this way. Prayer triplets are groups of three people who meet to pray for one another, for family and friends and for St. David’s. Pick up a leaflet from the foyer or have a word with the vicar for further information. St. David’s prayer topics will be on the back of the weekly news sheet. Prayer Triplets are now being coordinated by Sandra Allen and Stella Allwood. If anyone is interested in being part of a triplet, or would like more information, please contact Sandra on 836634 or Stella on 480002 and they will try to help you. Don’t forget to check the COMMUNITY NOTICE BOARD for local and community news and events with which church members are associated. Our ‘Open the Book’ teams continue to take the story of Jesus to local schools - click this link for more. ALWAYS BE AWARE - following an unfortunate incident a while ago in the church car park, when a car was broken into, may we remind people never to leave any items on car seats where they can be seen. This applies at all times, but especially during the darker evenings. Click HERE for selected archived contents. Selected Weekly talks/Sermons are currently temporarily on hold. Click HERE for the SDC player! She will text emergency prayer requests to those on the prayer chain, who will pray immediately. For non-urgent prayer requests, there is a book in the Lady Chapel where you may write the names of those who need prayer. They are prayed for daily and will appear on our prayer list on the back of the pew leaflet, unless you request otherwise. Could you come and chat on Thursdays? - Rachel Monk is looking for people who might come and chat with the young people at Castle Rock Lunchtime Club. There are now so many youngsters attending that it isn’t possible to talk to all of them. If you’d like to help, please see Rachel. Churches Together Good Friday outreach - last year on Good Friday Churches Together handed out hot cross buns, Real Easter Eggs, Good News newspapers and cards with an Easter message in the town centre and this will be repeated this year. Meet at Marlborough Square Methodist Church at 9.00am to help butter Hot Cross Buns, or meet at 10.30am at Marlborough Square to go out at 11.00am. Men’s walk on Saturday 16th February - On a fine morning ten men walked from South Leicester industrial estate across via Amazon and Ibstock brick clay hole, down the bridle path towards Ibstock, and back over the fields to Ellistown, where they had a very good breakfast at the Copper Kettle cafe. Could you help occasionally? . . .
… Thursdays, 12.30pm, Castle Rock - chatting to the young people attending the Lunchtime Club. … Thursdays, 3.30pm, small hall - to help chat, play card games etc. with the teenagers at the Y-Café drop-in. Please see Rachel Monk if you can help. will run during the 10.00am service on the 2nd and 4th Sundays of the month in the Green Room, and will be led by our Youth Worker, Rachel Monk, with Kevin Godfrey, Tara Gamble and Ruth Twells. Our wholeness and healing prayer team are always available to pray for us. They meet to pray before the 10.00am service and are in the Lady Chapel during and after 10.00am Communion services on the 2nd & 4th Sundays of the month. Do speak to them if you want someone to pray for you (they may even approach you if they sense you may need prayer). New weekly planned giving envelopes are now in the church porch. Please collect your numbered supply for the coming year. Two helpers are needed for Junior Church to assist the current team of three leaders and one helper. This would be just once a month during the 10.00am service. If you want to know more, or can offer help with this important ministry, please contact Ruth Godfrey. Momentum is for young people in years 6 - 9, which runs on the 2nd and 4th Sundays of the month during the 10.00am service, in the Green Room Contact: Rachel Monk. Passover meal & Holy Communion, Maundy Thursday 18th April - Join us as we hear the story of Passover and enjoy a meal with wine, commemorating the last supper Jesus had with his disciples. 6.30pm for 7.00pm in the church hall, cost £7.50. Please sign up today on the sheet at the back of church if you wish to attend.
. . . for all the filled Brown Bags for Lent containing essential items to help those in need locally. Donations have been/will continue to be given to Kingsgate Food Bank. Thursday Holy Communion Bake-off - congratulations to winner, Rachel Monk, for her delicious chocolate cake. Joint runners up: Maureen Bate & Alan Liggins. Well done to all who entered and/or helped raise £65 for LOROS. See photos below. Catching the Wave, 40 days of Bible reflections and prayer guide for our life today is available to purchase during Lent to help in private study (£4.75 from Andy). Brown Bags for Lent - this year we are encouraging everyone to take a brown bag (available in church from today) containing a list of essential items, which will help those in need in our area. Instead of giving up something for Lent, give something - pop an item in the bag each day, or set a small weekly budget to shop for items, or do one big shop and return it anytime during Lent. Bags will be donated to Kingsgate Food Bank. Loughborough Christian Bookshop - the Good News Centre in Church Gate, Loughborough, also has a wide range of books and Bible studies for Lent. Open Tuesday to Saturday 10.00am-4.00pm. at St. Peter’s, Glenfield. 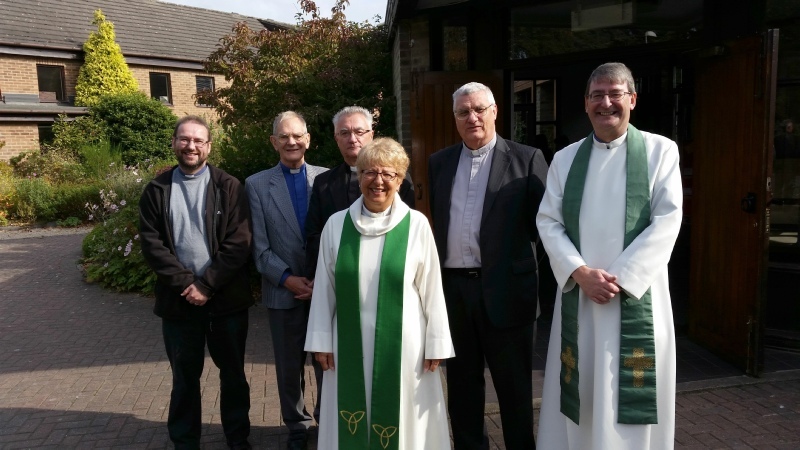 Do come and support Chris and Paul, as they are licensed for the coming year at this Archdeacon’s Visitation service. Shaped by God Everyday - following the Two Bishops Evening, there are leaflets and Shaped magazines at the back of church. Please help yourself. ...and Andy introduced some exciting times ahead with Trypraying, Thy Kingdom Come, events, Alpha & more. Defibrillator - We are pleased to announce that a Defibrillator in memory of Alan Sankey is now in operation at the entrance to the Church Hall. This has been organised and funded by Alan’s wife, Ann and St David’s would like to thank Ann for this generous and potentially lifesaving equipment that is now part of our Church. We intend to hold a small dedication service in memory of Alan at the Brigade anniversary service on Sunday 19th May at 10am. - Andy. Church Lads’ & Church Girls’ Brigade, Thursdays, 6.30pm, large hall, has grown and needs more adult help. Contacts Tim & Vanessa Cole tel. 454112. After School Church Experience Easter was on Wednesday, 3.30pm - 4.30pm. This was the last one of this term. Re-starts on 1st May. Church Bookstall - if you take items from the porch bookstall, would you please ensure that you don’t forget to put money for purchases into the box on the wall, as we are finding discrepancies between the amounts of money received and items listed as purchased. Thank you.